I am trying to install SQL Search 2.4 in SSMS 17 and I am stuck in 'Already Installed" setup screen. I do have SQL Search in VS 2017. Tried to uninstall in VS, but still got same message in setup. Please fix in next release. P.S. Also, looks like SQL Search 2.4 now requires registration/login with Redgate? Can you please try doing a repair of SQL Search? 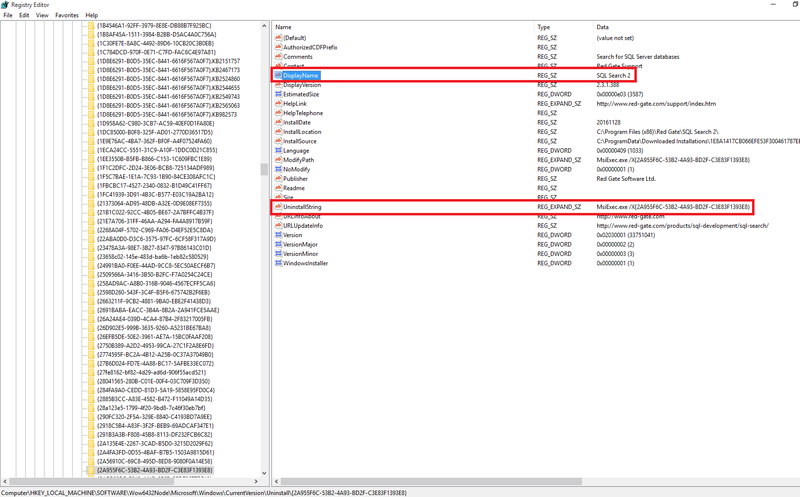 When it repairs, it should pick up on the SSMS 2017 install, and then a SQL Search folder should be created for the extension in C:\Program Files (x86)\Microsoft SQL Server\140\Tools\Binn\ManagementStudio\Extensions. Just tried repair, it didn't help. I still get 'Already installed'. I also tried to copy files from another PC to \Extensions\SQLSearch. Now I have SQL Search button in SSMS 17.1, but button doesn't work. Another PC has no VS 2017, only SSMS 17.1. SQL Search works there. Just to confirm-- the "already installed" error comes up when you're running a repair from Programs and Features? Can you please share a screenshot of the error? What version of SQL Search is currently installed? I am having the same issue. Am running SSMS v17.1 and am trying to install sql search 2.4. Below is a link of the error message am getting. Hi @Cotex1, sorry to hear you're running into this as well! Can you please then try running the latest installer again? @vfrenkel Please give this a try as well if repairing the tool did not help for you! same issue for me. I cannot install SQL Search, because it says it is already installed. 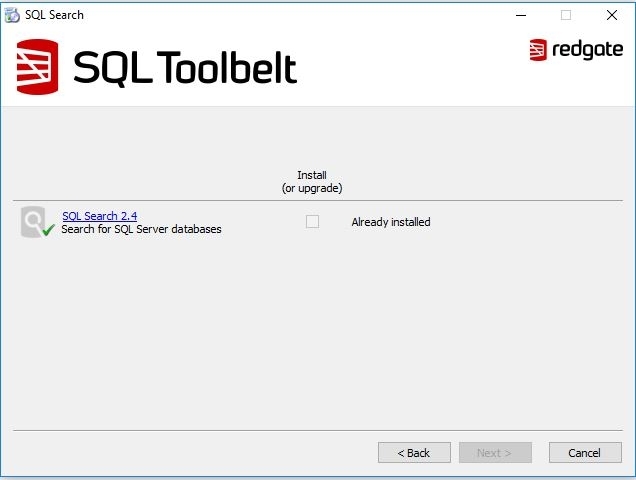 I've tried installing the SQL Toolbelt trial. Same problem with SQL Search. I've tried uninstalling SSMS and Visual Studio. Same problem. I've tried running the UninstallString proposed by Jessica, same problem. It seems even the uninstall does not work properly. Dialog pops up, but the dialog with the progress bar closes very quickly with any interaction. Now my Notebook is actually in a kind of state, where I cannot uninstall certain Redgate products at all anymore. The show up again after uninstalling them from the Control Panel. I was seriously considering buying SQL Prompt, because it's actually the best product out there. But as it is now, I will not. I hope my Windows is not screwed up, because of this situation. @Jessica R Thanks a lot, i did exactly what you said, restarted it and it now works. @Cotex1 I'm so glad to hear that helped and so sorry to @TomL that the issues have persisted for you! I'm going to open a support ticket for you, Tom, so that we can look further into this. "already installed" comes when I run SQL Search 2.4 installer after repair from Programs and Features. Screenshot see Cotex1 post. I have moved to another PC, installed SQL Search in SSMS 1st then in VS2017 and I am ok now. Thanks for the update @vfrenkel, glad to hear you've got things working on the new machine and sorry again for the troubles on the original one! Please let us know if anything else comes up.